Reproduction, duplication, or distribution for financial gain is strictly forbidden. I appreciate the wonderful comments and positive feedback on this video. I've shared some below. Just when I thought I'd seen all her tricks--she'd pull out a new one. This one's a keeper, for sure. and showed it so well! Your video came out terrific. Lots of great close-up shots. Beautiful beginning w/ you in the garden.Slow step by step instructions for beginners. Full development of the ptg. shown w/out much done behind the scenes. Complete explanations of all that you did. 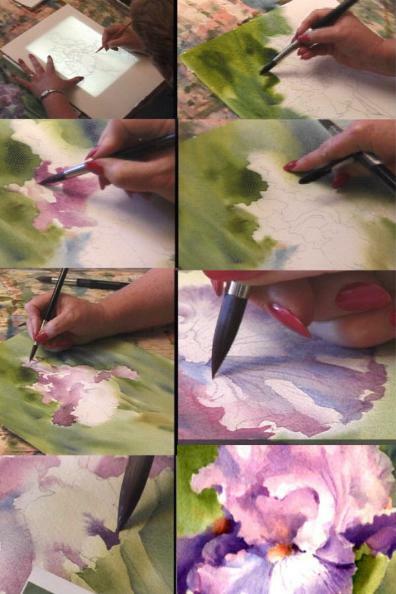 more importantly on the detail you explained - every stroke was well documented and why. Your patience is beyond me..........wonderful painting you did. 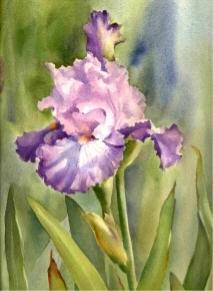 look so easy, but I'm sure it will take a lot of practice to paint an iris that I will be proud of! get it or remember how she did it. THINK about painting. It's unbelievable!! The finished painting is awesome! If I can do it half as good, I'd be a happy camper. I am thrilled that I ordered it and highly recommend it to everyone!! the time of the original rendering.